Choose dark leafy greens for the healthiest salad around. Then add the super foods and you'll have a salad recipe you'll return to again and again. 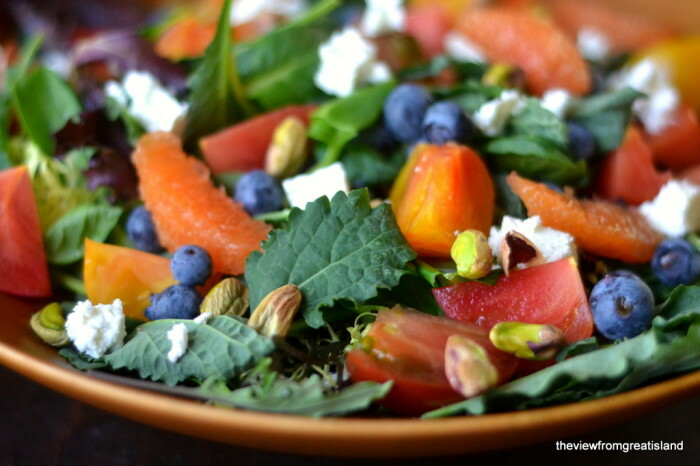 This is a salad that you throw together, a handful of salad greens, sprinkle with chopped tomatoes, a smattering of blueberries, some sectioned citrus, lots of feta cheese (or to your taste), pistachios (shelled, of course), and finish with rosy pomegranate seeds. Put in a container with a lid and shake before drizzling over your beautiful salad.